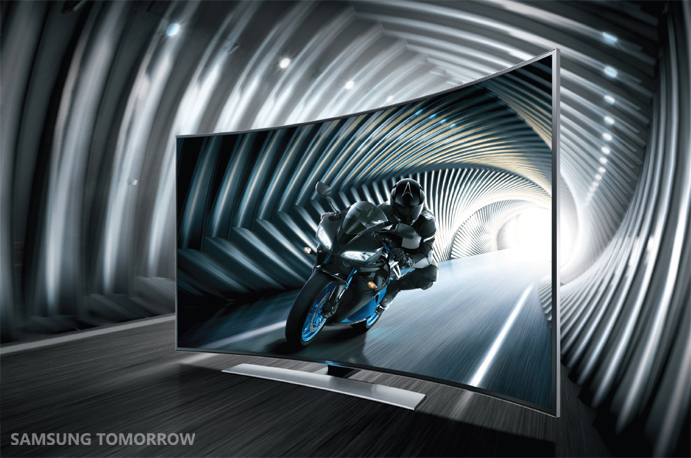 Samsung’s big brute bares beaut curves and a picture that some would die for, says our man on the TV battlefield, Pat Pilcher. BACK IN THE day buying a TV was a matter of choosing the right sized screen and which wood veneer finish most tickled your fancy – especially the latter. In those days choices ranged from what was then considered a whopping 24-inch, and fake walnut or mahogany. Back in the present, things have changed (and definitely for the better). There’s a huge amount of choice, but there is a downside: The sheer variety of TV sizes, shapes and technologies unfortunately requires that buyers do a heap of research and sift through reams of arcane specs before making a purchase. Decisions about things such as resolution (e.g. “Do I need a 1080p Full HD TV or should I go for Ultra High Definition?”) and smart features (“Do I need the web on my TV?”) make a big ticket buying decision just that much trickier. 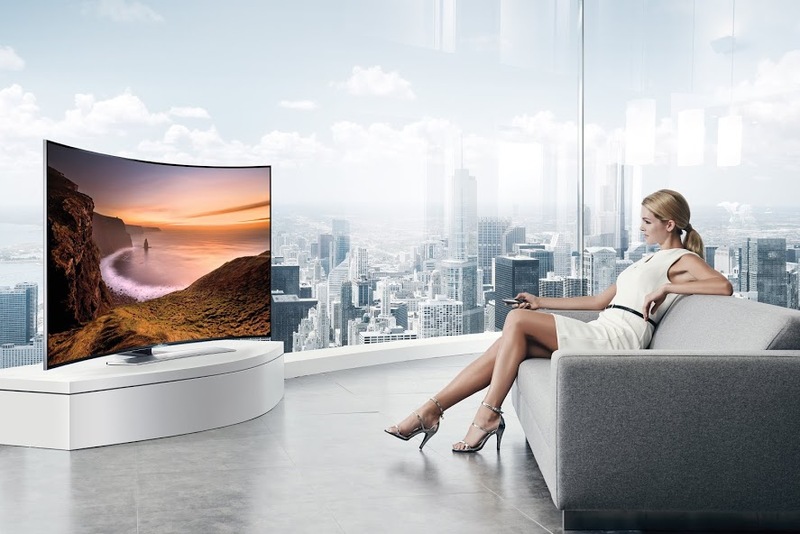 Now, more complexity has been added into the mix with dazed consumers having the choice of flat or curved TVs. 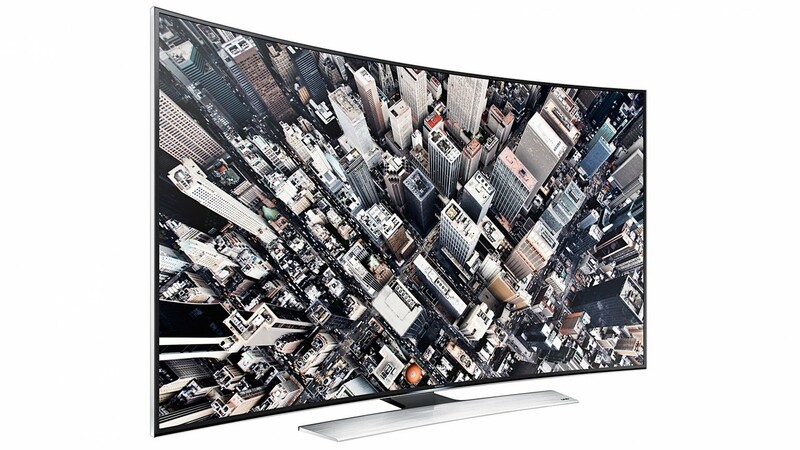 You’d be right to assume that the whole curved TV concept sounds weird. The theory goes that curved TVs suffer less from glare and draw the viewer into the onscreen image. After spending time with Samsung’s 65-inch UHD UA65HU9000W telly, I can say that there’s both truth and hype to this. Samsung have added a Depth Enhancer that they claim makes everything just that much more immersive. The concept is clever: a piece of software is baked into the video processing part of the TV that works out what is background, and what is foreground. It then tweaks picture settings for both, enhancing depth perception. It sort of works, too, with on-screen content seeming smoother and taking on extra depth. The Depth Enhancer lent TV shows a near cinematic quality. But was I more drawn in to viewing because of the curve? It’s hard to say. My first impression, having helped the poor courier carry the review unit down the steps to my house, is that the UA65HU9000W is both heavy and huge. I almost ruptured my spleen just attaching its stand and lifting it onto the TV cabinet. Even though I have a sizeable lounge, one wall was completely dominated by the TV. It was definitely curved. Glare from daylight in the lounge window had long been a curse with my current flat TV, but the curved screen of the Samsung was relatively glare-free. One of the big draw-cards with the big 65-inch is its UHD resolution screen. It may sound like a milk treatment process, but UHD (ultra-HD) is actually a 4x 1080p HD screen resolution. It’s a pretty compelling selling point if the not-so-minor sticking point of a lack of UHD content isn’t discussed. Checking out content on a USB memory stick kindly supplied by Samsung to showcase UHD was a revelation. Pixels were almost impossible to make out – even when standing less than a metre from the screen. The level of viewable detail was impressive. Individual leaves on trees or individual strands of hair were all visible. This was hindered a little by the use of LCD display technology, which limits contrast levels. This in turn reduced perceived sharpness levels compared to the likes of OLED or Plasma. Although the Samsung’s contrast ratio is still impressive, on-screen black areas of video are still dark greys while white areas are bright greys. The net effect of this is that some sharpness is lost which can blunt the impact of UHD. I was also able to track down some UHD YouTube content and use footage shot on my UHD-capable smartphone camera. Even with LCD they both looked brilliant, making 1080p look shabby by comparison. This said, the TV’s built-in content upscaler makes existing HD content look pretty good in UHD, and I was surprised at just how good broadcast TV content looked in faux UHD. Mind you, the big thing to remember with any upscaling technology is that the GIGO principle applies (that’s Garbage In/Garbage Out). Bandwidth constraints mean that Sky’s satellite signal is highly compressed and this is particularly noticeable with sports. Stadium crowds can become detail-free blobs of colour – especially during panning shots. Upscaled, this was still noticeable – just on a much bigger scale. The upscaler did do a reasonable job with Freeview, which as a terrestrial UHF broadcast, doesn’t suffer so much from the heavy compression used with a satellite signal. Blu-ray discs looked startling, and even DVDs made for good viewing. Streaming my own media content allowed me to see holiday photos and video clips in incredible detail. There’s also a bunch of apps and online content available via the Samsung Smart Hub, where I was able to access YouTube or surf the web. Another smart TV feature that I found myself going back to was Multi-Link. When watching a show you can shift on-screen content over and pull-up online content using a separate window. Although I didn’t test it, Multi-Link can handle up to 5 windows, allowing you to feed your inner attention-deficit disorder should the fancy take you. It sounds ideal for a spot of Facebooking/Tweeting while getting a dose of Shorty St. The reality was that using my smartphone, tablet or PC was just easier and quicker. Entering anything longer than a URL with the remote and on-screen keyboard is just too cumbersome. Another feature that’s bound to appeal to sporty types is Soccer Mode. It tweaks colour and contrast settings and can spot replays to record highlights, allowing you to feel vindicated when the ref does something silly. It’s a great idea that’ll no doubt also appeal to rugby and cricket fans. One of the more pressing problems facing smart TV owners that’ll emerge in a few years is likely to be a lack of upgradability. New video codecs and online standards are constantly being unveiled. Spending up large on a smart TV now could land you with an expensive screen that’s soon obsolete and not upgradable. Samsung have taken a smarter approach, and have built most of the smarts into a box that connects to the TV via an umbilical. Support for existing standards is great – the TV played nice with content from multiple sources. Plugging a USB drive into the TVs external box saw it handling MP4, AVI, DivX, Xvid or MKV media with no difficulty. Future format support should be available via firmware updates. If by now you’re guessing I was impressed, you’d be dead right. It is a great TV that packs an insane amount of functionality. There were however, a few minor things that didn’t quite work. Perhaps the most noticeable was the remote. It works a lot like a Wii controller – moving it about moves a pointer on the screen. Sometimes it seemed to have a mind of its own, with the pointer jumping all over the screen. Sitting right in front of the screen fixed this, but it was still frustrating. Happily, there’s also a normal remote. Another interesting quirk was gesture control, where a built-in camera picks up your movements, allowing you to use gestures to control the TV, Minority Report style. Sometimes I’d find myself changing channels by doing something as innocuous as scratching my head. At just a shade under $9000, Samsung’s curved UHD TV commands a stiff price premium, but it also packs a big punch, features-wise. For a start it’s an Ultra HD screen. There’s also a tonne of smarties baked in, bringing all the good bits of a PC or smartphone to the TV, along with gesture control. There’s also no shortage of apps, and it’ll play nice with photos and other media stored on a USB or network drive. About the only feature missing is a kitchen sink – virtually everything else you could possibly want with a TV has been built in. It isn’t perfect though. If you’re obsessed with contrast ratios you may want to hold out for an OLED or plasma UHD TV (you’ll be waiting for a wee while). Both will supply deeper blacks and more brilliant whites.